Some people just find the cuteness of turtles to be irresistible. That is the reason they have a turtle tank in their home, to keep one for themselves. The turtles look even better when you have a well managed and established turtle tank with all the important features. One of the most important amenities to have is the best available filter for a turtle tank. The filter makes sure that the water is cleaned regularly and keeps the tank a healthy place for the turtles. Does a Turtle Tank Need a Filter? How to Choose the Best Filter System for Turtle Tank? What is the best filter for a turtle tank? Turtles are just like any other organisms that live in a tank. They need a clean environment to live in, and that is where the filter comes in. At some point, the water is going to get dirty and need cleaning. It is important that you get a filter that can handle the tank size and also comes with an impressive flow rate. A great flow rate ensures that the turtle is not affected when the filtration process is ongoing. Since this model would be used externally, it is made to offer the highest durability so that you can always trust it to deliver the best performance. It is one of the most durable canister filters that you can buy today. The cover might be made of plastic, but it is a hard plastic, which assures the user that it will last for a long time. If you want it to last, then simply take good care of it. Some regular maintenance should keep the filter working properly for as long as possible. Setting up the aquarium filter is going to be the scariest part for most people. Setting up this filter is not difficult at all. You just have to make sure that the canister is properly set up as directed by the manufacturer to provide the right filtration. The instructions offered by the manufacturer might look limited, but it should be easy to set up this filter in just a few steps. No need to get a plumber, as this installation is easy. Many people who have bought this model claim they have set up their model in just fifteen minutes. You too can do the same without much trouble. As for the flow rate, most people want a filter that can deliver superior capacity. This model provides the best capacity that you get. It delivers an impressive flow rate of 312 gallons per hour. This means that more water can be filtered in an hour. The manufacturer included a spray bar that helps with water aeration and circulation in the tank. The water in the aquarium is filtered easily in a short time. The moment you feel this model in your hand, you will sense that it is worth all the money spent on it. 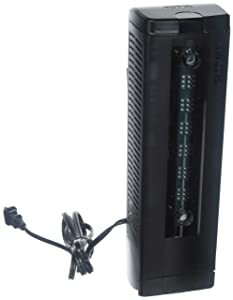 It is well constructed to withstand everything the user might put it through over the years. With this model, you do not have to worry about that the filter will be made of cheap plastics. This filter has a 4-clamp locking system important to support the motor and make sure it keeps on working properly. This system is also important to prevent any water leaks, as it keeps all the points under a tight seal. The parts are designed in different shapes so that it’s easy to set up. You simply have to observe the shape of the part and make sure it gets to the right position. Having a flow rate of 240 gallons per hour makes it one of the best models you can get today. That should make it easy for most users to have their aquariums filtered in the least time possible. It is not just about having a great flow rate, but also the impressive sizes of aquariums it can handle. This model will work for aquariums from 20 gallons to 150 gallons. This range should allow a great many people to use it in their aquariums. You might also be surprised by the small amount of noise you get from this model. It is designed to operate quietly, as compared to some other models that have been around for ages. Being a new model, people thought that noise suppression might not have been a priority in the design, but it was. Overall this model has a solid and sturdy construction. This is without a doubt a great feature that most people are seeking when buying a filter. The strong construction keeps it as the favorite of the models available today. All the parts are designed to meet the standards that have been laid out by the regulators. The clamps on this model come made of stainless steel. This is crucial to ensure that you can lock the motor head in position. This will keep it from wobbling when the motor is turned on. No more using the plastic clamps that can easily break when you really need them. The setup process for these canister filters is easy. The same goes for mounting the filter to the aquarium. For those that might have assembled a similar model before, it should be easy to get down to work with this model. Newbies might have a few problems setting up, but you will get it done in time. You can always check out some online videos shared by other users that show the steps. The cleaning part might be a consideration for some people when buying this filter. Make sure you refer to the manual for instructions on taking the filter apart and cleaning it. Once you are done with the cleaning, you should put it back together and mount it back onto the aquarium. Unlike other models whose stated flow rate might never be achieved, you should do so easily with this model. Its capacity of handling up to 300 gallons is one of the best features it has to offer. You will find it being used on different aquariums with various capacities. 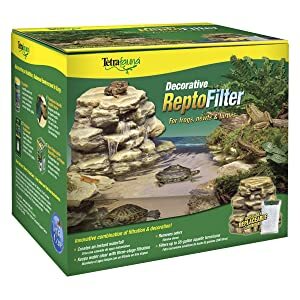 It is now possible to make your turtle habitat look better than ever by getting this type of decorative filter. As much as it will be working as a filter, it will also be increasing the aesthetic appeal of your aquarium. The natural stone blends that will look great when combined with the vegetation and rocks in the environment. You also get to create an instant waterfall feature with this model installed in position. The model is not just great for water filtration, but also helps by making the water clear and removing any odors that might have accumulated over time. The design makes it possible to use the model for shallow water, which would be preferred by turtles, frogs, and newts. With the model in the right habitat, you should find that the turtles would like it even more. The three-stage filtration process is something that is going to make it possible for you to enjoy using this filter for a long time. The multiple filter stages will ensure that all the contaminants are removed from the water, leaving the water clean. The setup process is definitely easy. There are only a few parts to this unit so putting it together will not be a problem. The manufacturer has also provided a detailed manual that should help with putting the filter together and getting it in position. Once it is set up, it will not even look like a filter due to its realistic stone appearance. The model features large intake holes that will prevent issues of clogging over time. This means you do not have to worry about regular maintenance of the filter. Having a locking cover is important to keep the animals from getting into the filtration area. This model features a new sleek design that most people today would find very appealing. There are also new features introduced into the filter to make it better at filtering your aquarium water. Some of the features include having a redesigned media cartridge. What this does is trap more debris than others. With more debris removed, you will have cleaner water in your aquarium. The model comes with an outstanding three-stage filtration capability. This is important to ensure more waste is removed from the water to keep a safe environment for the turtle. There is also increased water movement with this type of filter, meaning that you get to remove even more waste than before. The water movement is further great for aeration, keeping the water fresh and aerated for the turtle. For those who might have had issues finding space to fit in the external filters, you can switch to this model. It is made to be an internal filter thus being better to use where the external filtration might have been a problem. 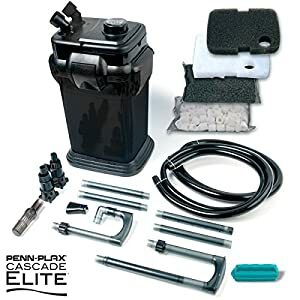 Its capacity is great-it can handle aquariums of capacities up to 65 gallons. Most aquariums that people keep today are within the range that this filter can manage. You should have no problem at all filtering the different types of aquariums for your turtles. Make sure to follow the instructions for installation as given by the manufacturer. This is to ensure that the filter always keeps working correctly. The best part about this model is that you can use it for freshwater, reptile, and saltwater environments. 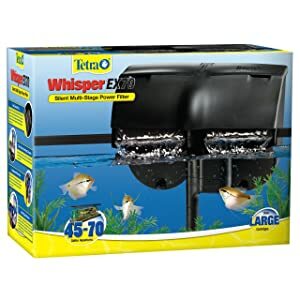 This filter is one of the best models to come from the Tetra Whisper brand. It is capable of effectively cleaning aquariums of up to 70 gallons of water capacity. You might find this useful if you are a hobbyist and a beginner in the world of aquariums. The manufacturer also made it easy to use straight out of the box. You will not have to worry about spending a lot of time to set it up. It should be perfect for both new tanks and those that have been running for a while. That is how the model is designed to be flexible. This model comes with two large carbon filters. They are important for cleaning the water in the aquarium. The filter also features two bacteria growth plates you can use to check the health of the aquarium water in the tank. You should now be in a position to keep the plants and fish healthy all the time. The small and compact nature of this filter should make it easy to disguise it among the props and plants. You do not have to worry that adding this filter to your tank will make it look unattractive. The manufacturer went a step further to include time strips in the model. The strips will let you know when it is time to replace them and do maintenance to the filter because they will turn red. The cleaning part is easy as the cartridges will simply lift out without leaving a mess. With the name Whisper, you expect that this model will be offering a quiet operation. Well, that is what you get when this model is running. This is a convenient filter you can place in a room and never have to worry about the noise. This model is designed to be a submersible filter, thus proving to be great for some people looking for internal filters. Its construction and multiple features truly make the model great when it comes to feeling its worth. For those who own a large tank, this model would be a great one to opt for. The reason is that it can handle greater capacities, up to 80-gallon aquariums. With a flow rate of 265 gallons per hour, you should find that filtering your aquariums will not take a long time. With such flow rate and design, you do not need bypassing the unfiltered water. There will be no disturbance to the aquarium when the process happens. The model features dual filter elements. These two help provide the quality mechanical and biological filtration that you need for the aquarium. You can place the filter horizontally or vertically and it will still work, thanks to the unique design. With the spray bar included, you have improved aeration of the aquarium. 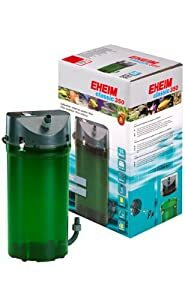 There is also the inclusion of a filtration sponge and other necessary accessories important for setting up and mounting the filter in the tank. Unlike some other models on the market, this one comes as a completely silent model. You might not realize it is on until you get close to it. The carbon filtration system is another important feature of the filter, as it helps remove impurities, discolorations, and odors from the water. The filtration process of this model is simply better than on many other mainstream filters. This is the reason the filter keeps on getting more positive reviews showing it is worth all the money you will spend on it. Since it features a four-stage filtration system, you can always be sure that it will deliver the clean and clear aquarium water you need and want. The stages include a dry/wet diffuser grid, biological, mechanical, and a chemical stage. The model comes with a high flow rate. This is important for anyone looking to buy a model that will filter the water fast and still avoid any sort of disruption to the turtle tank. The flow rate is rated at 155 gallons per hour and it will work for various aquarium sizes up to 40 gallons. The manufacturer made this model with an adjustable return flow rate. You get to make the adjustments depending on the demand on the turtle tank. The brands would not lie, as the reputation of a brand will always be reflected in the type of products that they get to sell. It is always better to get a model from a reputable brand. Even if the brand is new, it should quickly get the best reputation if it delivers the best products. The brands we have reviewed in this guide are some of the top brands in the industry. You should have no need to second-guess them at all. These are two of the most important features you always have to consider when picking the right filter for your turtle tank. The manufacturer will have this information in the product description, so it should not be hard to find a filter that works great for your model. The flow rate of a good filter is supposed to be high. If you get to filter more water whenever the filter runs, then you should have no trouble at all keeping your tank clean. This will also maintain the environment undisturbed for the turtle. No one wants to spend good money on a flimsy product. It is important that you select a model with the right construction. The type of material used is important for the durability of the model. Most of them are made of plastic material—what is important is how strong the plastic is. Having a hard plastic model with several metal parts could make it better for long-term use. The motor serves an important role for any filter. You have to consider choosing a model with a reliable motor. Having a reliable motor means that you get to use an efficient and effective filter that should work for a long time. The motor should also be easy to maintain. Depending on the type of construction, some motors might not ever need any maintenance. As much as the work of the filter is to clean the water, it will get dirty with time or need maintenance. The model you choose should be easy to take apart and maintain. Most manufacturers will provide you with a proper guide on the maintenance of the turtle tank filter. A number of things are involved in picking the best turtle tanks. What is important is that you choose a model that will make the turtle tank water clean and great for turtle to live in. From the many models reviewed above, Hydor Professional canister filter stands out as the best filter. It comes with a strong construction that should make it usable for many years to come. Furthermore, it has an impressive flow rate, which should make using the tank easier and effect more effective over the years. 1. How to set up canister filter for turtle tank? Setting up the filter is going to vary from one model to another especially with the working mechanism. The set up of an external filter is different from an internal filter. Start by assembling the filter if it shipped with several parts not assembled. Follow the guide as given by the manufacturer to assemble the filter effectively. Attach the mounting accessories to the filter and get it mounted in position. If it needs connecting tubes, you have to make sure at the joints it is tightly sealed to avoid having leaking issues. 2. What type of filter for a turtle tank? 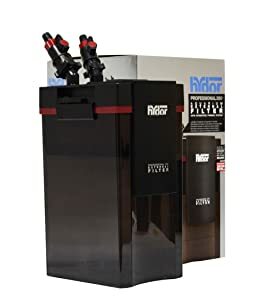 The type of filter you get to choose is going to depend on various factors such as the tank size, flow rate, durability, brand and many more. You also have to keep in mind the space available. It is the reason you find some choosing internal filters over external filters because of space. 3. 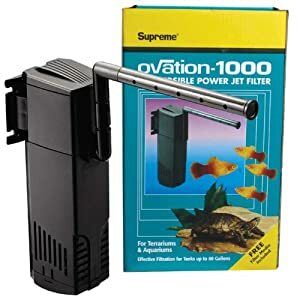 Can you use a fish filter for a turtle tank? Yes. It is possible to use a fish filter for the turtle tank. Most of the manufacturers make the filters highly versatile so that they can work for various types of environments. You always have to check out the product description first to understand where best to use the filter. 4. How often should I clean my turtle tank filter? Different filters would come with different timelines for cleaning them. It is important to stick to the timelines offered by the filter manufacturer. It will help you keep the filter in pristine condition so that it can keep on working properly over a long time. It is without a doubt that you now have an idea about choosing a good filter turtle tank. 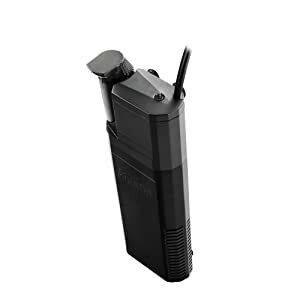 With the various options available from the buying guide above, you should have no problem picking one that is within your budget and works great too. Even if you get to choose a cheaper model, just make sure that it does not have issues with durability. It is always better to spend more and still get to enjoy better durability when it comes to its performance. We use the decorative Tetra waterfall style filter for our turtle tank. The design of the filter looks amazing in the tank, but there are a few things to note with this filter. One is the water intake consists of small holes along the bottom. If you use small gravel in your turtle tank, as the turtle moves around and kicks up gravel it’s possible for the gravel to get sucked into the holes and clog the water intake. I would strongly recommend larger sized gravel in the tank, or at least around the filter. Another is this filter uses two standard Tetra cartridges slid into slots on each side of the filter. The top half of these cartridges will be above water, so they will be damp but not submerged. If you’re not careful, this could become a perfect breeding spot for annoying “drain flies”. Third is this filter goes through cartridges rather quickly since turtles are so messy. But there is an empty space between the water intake and the filter cartridge that is big enough to cut and insert a piece of sponge filter media to catch all the larger waste before it reaches the cartridges. Use a coarse, stiff sponge type media that is easy to remove, rinse, and reuse and this will save you a lot of $$$ on cartridges! Don’t use a softer or thicker filter media as it tends to make the pump struggle to move the water through it all. The sponge trick sounds very useful. But on the subject of gravel clogging, sadly turtles shouldn’t be housed with any rocks smaller than their heads. The turtle could swallow the gravel, causing impaction. So after reading a bunch of recommendations not from this site, I ended up buying a fluval FX4. Am curious as to why it didn’t make your list?